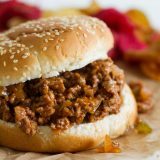 These Easy Sloppy Joes only take a few ingredients and are super easy to make on busy days when you don’t feel like cooking dinner. And they are always a family favorite! Brown the ground beef in a large skillet until it is no longer pink. Drain if necessary. Add the celery and onion to the beef. Cook until tender. Add the tomato soup, salt, and chili powder. Stir to combine, reduce the temperature and simmer uncovered for 20 minutes. Serve on the hamburger buns.